From the canton St. Gallen, you can reach the canton Appenzell Ausserrhoden over the Schwägalp pass. The Schwägalp is near to the Säntis and is the largest elevation of eastern Switzerland. The peak rises up to a proud 2501 metres. 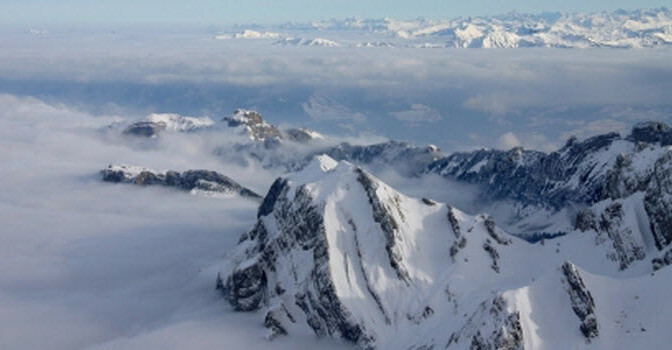 Once you have reached the peak of the Säntis, you can observe a total of six countries from a bird’s eye view. Firstly of course Switzerland, but depending on the direction that you are looking in, you can also see the principality Liechtenstein, Germany, Austria, Italy or France. The comfortable journey with the Säntis cable car begins from the Schwägealp. You are at the peak of the Säntis in approximately ten minutes. Particularly romantic offers are the sunrise and full moon journeys on the mountain. It is possible to reach the Schwägalp comfortably with your own car and with the Post bus lines. The Mountain Hotel Schwägalp enjoys greeting day trippers and holiday guests, they are entertained and lavishly looked after. Not far from here, you can discover the history of the earth: the Geological Rock Park on the Säntis does not only invite guests of the Mountain Hotel Schwägalp, but also other peak visitors to an excursion into the world of rocks. The Schwägalp cheese factory offers an insight into the world of dairy products for people who are interested. The first Guesthouse opened it’s gates on the peak of the Säntis in 1846. The mountain was discovered for a different reason in 1882: it should serve as a whether station because of its height. It was necessary back then to have a whether attendant, who gathered the information and passed it on. Nowadays, this happens automatically. Only four years later it was starting to be considered that the Säntis be opened up through a mountain train. Work on the Säntis cable car began in 1933 and just two years later, the route was initiated. In the meantime, a well built street connection up to the Schwägealp existed. After a few decades, the cabins of the Säntis cable car were enlarged in order to cope with the storms of visitors. A new building project began in 1968: the Säntis cable car should be completely renovated. This ambitious plan took ten years. The large cabins can now take up to one hundred passengers. At the same time, the station was modernised and restaurants start to settle here. Modernisation was necessary once again in 1995. The mountain station Säntis moves with the times, everything becomes bigger, nicer and more comfortable. The cabins are also overhauled, once again.